I almost always buy fresh carrots with their feathery green tops attached. In the past, I would invariably cut the tops off and send them to the compost bin. Honestly, it never occurred to me that they were edible. But the tops of other root vegetables are edible, so why wouldn't carrot tops be edible, too? One day I blanched the leaves, puréed them with a little olive oil, and then used the purée as a gorgeous green accent sauce for fish, much in the same way I use basil oil. 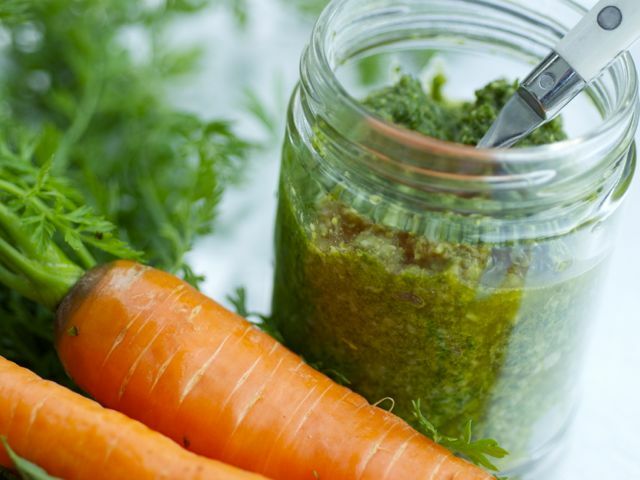 My next idea was to make pesto, trading out the basil for carrot tops, which proved an amazing alternative. This recipe is an absolute keeper, and it's satisfying to make use of the whole plant. I serve this as a dip with crudités, and often add a dollop on top of bruschetta that has been smeared with fresh goat cheese. It's also perfect simply tossed with pasta. In a food processor, combine the carrot leaves, oil, garlic, and salt, and process until finely minced. Add the pine nuts and pulse until finely chopped. Add the Parmesan and pulse just until combined. Taste and adjust the seasoning. Use immediately, or cover and refrigerate up to 2 days. Toasting pine nuts, almonds, walnuts, pecans, hazelnuts, cashews, and pumpkin seeds brings out their flavor. Spread the nuts or seeds in a single layer on a rimmed baking sheet, place in a preheated 350-degree oven, and toast until fragrant and lightly browned, 5 to 10 minutes, depending on the nut or seed. Alternatively, nuts and seeds can be browned in a microwave. Spread in a single layer on a microwave-safe plate and microwave on high power, stopping to stir once or twice, until fragrant and lightly browned, 5 to 8 minutes. Watch them closely so they don't burn.